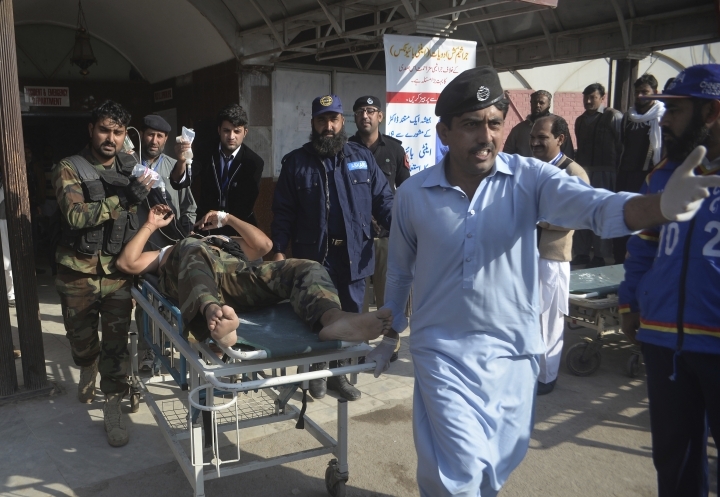 PESHAWAR, Pakistan — Islamist militants stormed a provincial government complex for agricultural research in northwest Pakistan on Friday, killing 12 people including students and wounding 35 others, police and rescue officials said. 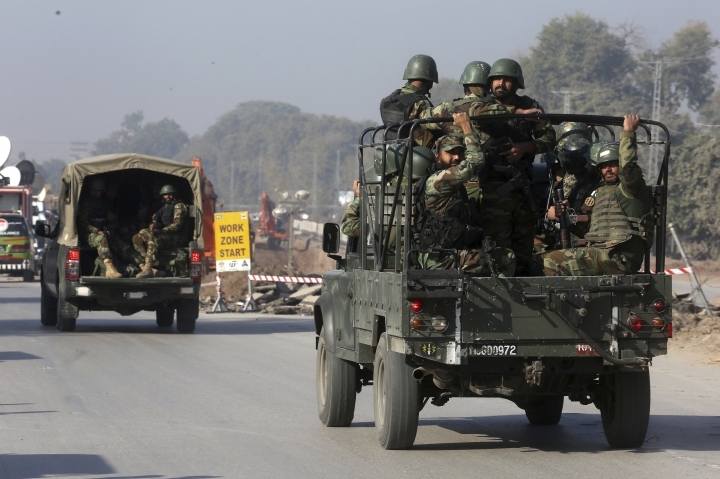 Police and military troops killed three attackers during a firefight and while clearing the complex in Peshawar, the capital of Khyber Pakhtunkhwa province, they said. The main Taliban militant group, Tehrik-e-Taliban Pakistan, claimed responsibility saying the place they attacked was housing a secret intelligence office. Police chief Salahuddin Mahsud of Khyber Pakhtunkhwa province said attackers opened fire on the main gate of a provincial agricultural department complex, initially wounding two guards and two students. Mahsud said three attackers clad in women's burqas then reached the gate in a rickshaw and opened fire to clear their way to the building. The ensuing firefight left 12 dead and dozens more injured. Mahsud told reporters after the complex was cleared that among the dead, six were students and one was a guard. Six others were being identified. Mahsud said before the attackers could reach other hostels, security forces were able to evacuate residents in armored vehicles. "Police and military troops engaged in a quick and well-coordinated firefight and evacuation efforts saved scores of lives, otherwise the death toll could have been much higher," he said. TV footage showed bullets holes in building walls, blood stains and broken glass scattered on the floor. A comparatively small number of students and others were present in the typically crowded complex at the time of the attack because Friday is a holiday — the day when Muslims celebrate the birthday of the prophet Muhammad. Government and private buildings in the town were decorated and religious rallies were being carried out across the country, with sweets and milk distributed at street stalls, to celebrate the holiday. Officials refuted the militants' claim that the agriculture directorate was housing any intelligence office. They said militants have attacked education institutions in the past. The attack was third major one on educational institutions in the country's northwest in recent years. 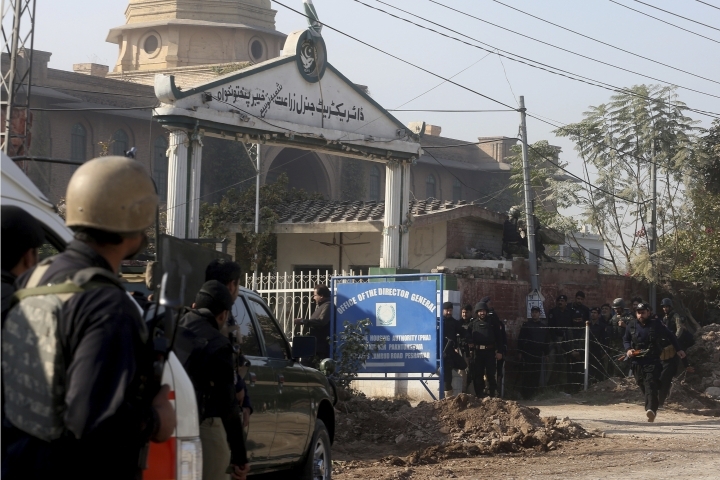 In 2014, militants attacked an army-run school in Peshawar killing more than 150 people, mostly school children. In the adjacent town of Charsadda, militants attacked Bacha Khan University, named after a secular leader, in 2016, killing more than 20 students. Military spokesman Maj. Gen Asif Ghafoor said Tehrik-e-Taliban claiming responsibility for the attack proved it was planned in Afghanistan where the group is based. He said the attackers were in constant contact with their handlers in the neighboring country. Ghafoor added that Afghanistan's director general of military operations was currently in Pakistan and that the issue would be taken up with him. In Washington, the U.S. State Department condemned the assault, offered condolences to the victims' families and said the U.S. government will continue to work with Pakistan and across the region to combat the threat of terrorism. The attack came over a week after a suicide bomber killed top police official Mohammad Ashraf Noor and his guard in the provincial capital. 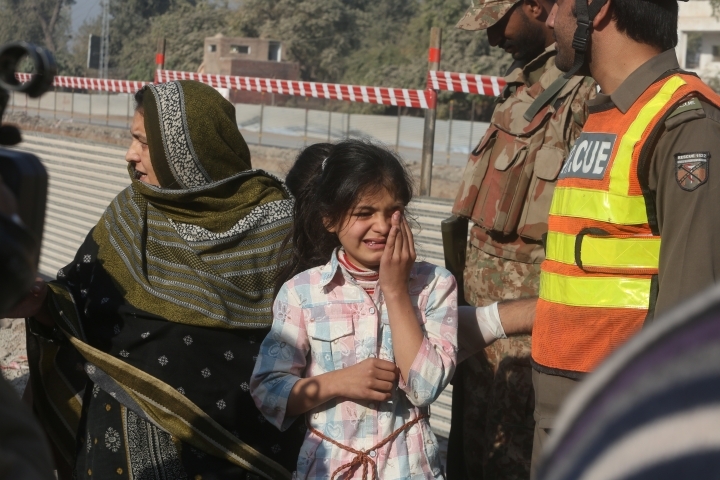 Pervez Khattak, chief minister of Khyber Pakhtunkhwa province, expressed grief over the nine lives lost. "These terrorists have no religion as they attacked on a day which is very sacred and the nation was celebrating it," he said. The police chief said police and military troops quickly cordoned the building, closed in and killed the gunmen who had holed up in a building in the complex. The complex includes offices, a teaching institute and a hostel. Among the wounded were two soldiers, seven policemen, a reporter and a private guard in addition to the students. Some were in critical condition, authorities said. Mahsud said dozens of students and others were rescued during the operation. He said after eliminating the attackers, security troops were searching and clearing the buildings. Security forces in the clearance operation seized an explosives-laden vest, hand grenades and several assault rifles that the attackers had been carrying. Elsewhere Friday a young boy was killed and another wounded when a bomb exploded near the Christian Eisa colony in the border town of Chaman in southwestern Baluchistan province. Police officer Naimatullah Tareen said the bomb was a timed device and planted at the entrance of the colony where boys were playing. The Chaman town on the border with Afghanistan. Associated Press writer Ishtiaq Mahsud in Dera Ismail Khan, Pakistan, contributed to this report.